Pool cover on a cruise ship? Sure, we can do that. Industry insiders know that for custom swimming pool covers, the only company to call is In Depth Events. Our experts have handled everything from wedding receptions in private backyards, Bat Mitzvahs in palatial garden manors, chic clear installations for private events, and corporate parties at hotels, casinos, and country clubs across the US. Our staff is used to the challenges that come with providing clear, frosted, and utility pool covers. In fact, we are the ONLY company in the south that can provide flush mount pool covers for our clients. In other words – we’re used to challenges when it comes to building custom swimming pool covers and stages. However, when the Tom Joiner people called us, we have to admit that we were taken a little off guard. 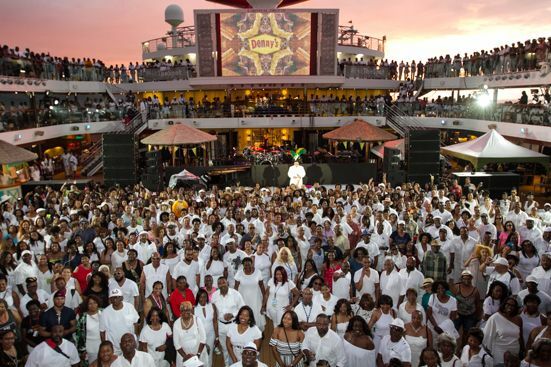 Every year, the Tom Joiner Fantastic Voyage brings a Christian celebration of music and ministry to its attendees. In the spring of 2018, the cruise ship Carnival Breeze was selected as the host ship or this seven-day cruise. 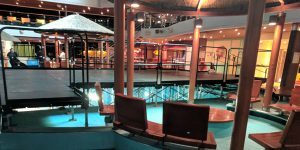 The Tom Joiner people wanted to know – can we build a performance stage over a pool – on a cruise ship? Of course we can! After several meetings with Carnival staff, several sets of drawings, and several conversations with our engineers, we loaded our equipment on the pool deck in late April using a crane. We had to make sure every last part was in our pack – there are no Home Depots in the Gulf of Mexico. When the night of the build finally came around, our crew faced a rainy night and rough seas. It’s hard enough to build a stage in a swimming pool – it’s even more difficult when the swimming pool is moving around you! 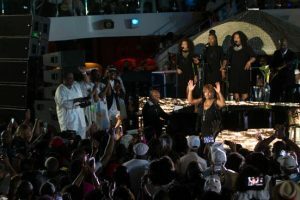 However, our expert stage builders prevailed and finished the build well in time for the headliner, Anita Baker, to perform. The Tom Joiner people were amazed at the transformation of the pool deck, Cardinal’s staff was happy with our respect for their performance area and their engineering staff, and our stage builders went away with a sense of accomplishment for a job well done. For your next swimming pool cover, make sure to contact the experts at In Depth Events. We look forward to hearing from you, and working with you! How much dose a LED floor cost? *This pricing is the rental of a floor for one day only. Other factors may cause the rental cost to increase (or decrease). However, this tool will definitely get you an idea of what costs might be for your needs.